"I just knew that run was important and we needed to find a way to get it in," Arcia said through translator Carlos Brizuela. "I was just trying to hit it on the ground that way. I wasn't really trying to get it over the bag, but I'm glad I did." Arcia added two other hits and helped the Brewers stay 1 ½ games behind first-place Chicago in the NL Central. Yelich belted a two-run homer to center off Pirates starter Chris Archer in the first to give the Brewers an early lead. Shaw followed two batters later with a solo shot to stake Milwaukee to a 3-0 advantage. The Pirates threatened in the second. With a runner on and one out, Cain leaped above the wall in center, robbing Jordy Mercer of a home run. "He's doing things all over the field. He's making his presence felt," Milwaukee manager Craig Counsell said. "It's something to behold." "He's just impressive to watch. Defensively, he's made so many of those plays this year, it's hard to keep track," Shaw said. Pittsburgh broke through in the third against Milwaukee starter Gio Gonzalez on Jordan Ludlow's run-scoring triple. Ludlow then scored on Francisco Cervelli's sacrifice fly. Pablo Reyes' first career homer, a solo shot in the fifth, tied the score. "He's got no fear in his swing. He likes to hit, he likes to swing the bat," Pirates manager Clint Hurdle said. "He's a young kid, getting an opportunity." The Brewers regained the lead in the bottom half of the inning on a sacrifice fly by Jesus Aguilar. Milwaukee extended the lead to 6-3 on Arcia's bunt against Pirates reliever Steven Brault. Arcia then stole third, but was cut down at the plate trying to score on Cain's grounder to short. Moustakas' solo home run into the second deck in right in the seventh gave the Brewers a four-run advantage. Pittsburgh pulled within 7-4 in the eighth on Josh Harrison's RBI double. Corbin Burnes (5-0) picked up the win in relief. Jeremy Jeffress pitched a scoreless ninth to record his 12th save in 17 chances. Gonzalez, making his second start for the Brewers since being acquired from the Washington Nationals, gave up three hits and three runs in 4 2/3 innings. Archer surrendered six hits and four runs in five innings. He slipped to 1-3 in the National League and 4-8 this season after being traded from the Rays in July. With Polanco out of the lineup, four players will compete for time in right field, Hurdle said. Adam Frazier, Jordan Luplow, Pablo Reyes and rookie Kevin Kramer, who was called up Sept. 4, likely will share right-field duties for the remainder of the season. "It's going to be a daily decision on who we want to play second base and do we want to move Kramer to third base," Hurdle said. "We did that the other day." Luplow got the start in right on Friday night. 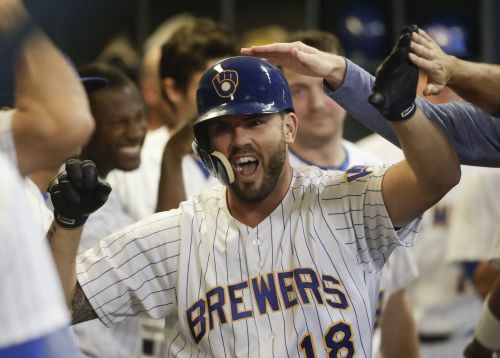 The Brewers and the Wisconsin Timber Rattlers, their Class A affiliate, agreed on a contract extension that will run through the 2022 season. "One of the best minor league relationships I've ever been a part of. It's a first-class organization," Brewers general manager David Stearns said. Yelich and Shaw belted their 29th homers of the season in the first inning. Yelich has reached base in 29 consecutive games, the longest current streak in the National League. Pirates: OF Gregory Polanco is expected to be out seven to nine months after undergoing surgery on Wednesday to repair the labrum and stabilize his left shoulder. Polanco dislocated his shoulder on awkward slide into second base last Friday against Miami. "Now is the healing, the rehab, and the strengthening and then the getting ready to play, whenever that is," manager Clint Hurdle said. . RHP Chad Kuhl, on the disabled list since June with forearm and elbow tightness, is scheduled to re-examined after being unable to throw his scheduled side session earlier this week. ... A fifth-inning liner off the bat of Orlando Arcia struck Archer in the right buttock. The pitcher had trouble standing at first, but remained in the game. ... Starling Marte was struck by a pitch on the left elbow in the seventh. He stayed in the game after being checked by a trainer. Pirates: Ivan Nova (8-9, 4.17 ERA) is 2-2 with a 3.03 ERA in six career starts against Milwaukee. Brewers: Zach Davies (2-5, 4.75) is 2-3 with a 6.49 ERA in seven career starts versus Pittsburgh.